Highlights from Nial Moores, Kevin Johnson, Vince Smith, Therese Catanach and Kazunori Yoshizawa. A belated report on a week in the field, at Seosan (25th), Mokpo, Heuksan Island (26th-29th), Gocheonnam (30th), the Geum Estuary (31st) and several sites between Jeonju and Daegu (September 1st). Outstanding highlights included a close encounter with two typhoons, a first national record for the Republic of Korea (a Western Sandpiper – though apparently not documented with any image), a species of bark louse likely to be new to science (by Dr. Yoshizawa), and a total of c. 145 bird species, including Swinhoe’s Storm Petrel and South Polar Skua, Spoon-billed Sandpiper and Nordmann’s Greenshank, Black Woodpigeon, Black Paradise Flycatcher, and even an apparent Chinese Flycatcher Ficedula elisae! Swinhoe’s Storm Petrel: At least four were seen on the way across to Heuksan, though much better views were had of at least 15 birds (on one side of the boat only) on the way back to the mainland on the 29th. Northern Goshawk: A juvenile on August 25th near Seosan is likely indicative of local breeding. “White-faced Plover”: A juvenile >First-winter (photographed by Vince Smith: see http://www.birdskoreablog.org/?p=5977) was almost the first bird that we saw on Yubu Island on August 31st. Nordmann’s Greenshank: Three (including at least one juvenile) were well-watched, even if a little distant, at the Geum Estuary on August 31st. Western Sandpiper: On 31st at the Geum, an adult (presumably female) in worn post-breeding plumage was scoped by NM at medium-close range in excellent light, in a mixed flock of small shorebirds. Although heart-stopping views were brief (probably ten seconds in total), identification was made confidently on the combination of e.g. small-size (slightly larger than Red-necked Stint, in direct comparison), long Dunlin-like bill (quite similar-looking bill profile to several Dunlin in direct comparison), and dark upperparts (blackish, worn, lacking much of a supercilium, with obvious patchy rufous in the scapulars), and a dark fairly solid looking breast band, with a few weak ticks on the flank sides, contrasting with silky white underparts). 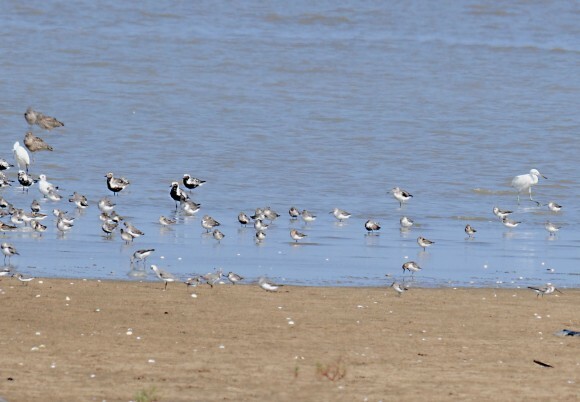 An attempt to get an image and to get others onto the bird failed by seconds, as the flock of shorebirds containing the Western took flight due to the incoming tide. 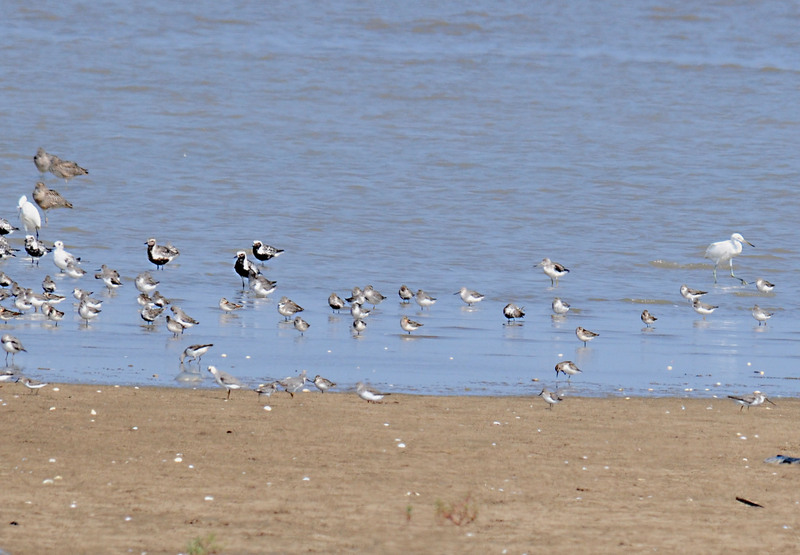 Although Western Sandpiper occurs very rarely in Japan, this is the first record in the ROK. Spoon-billed Sandpiper: Four (all adults) were well-watched and well-appreciated at the Geum Estuary. Oriental Pratincole: A juvenile at Gocheonnam on August 30th was a good find. “Taimyr Gull” Larus heuglini taimyrensis: Two immatures in worn plumage at Heuksan pre-typhoon on August 26th were considered more likely to be over-summering than early southbound migrants (usually first from about September 10th). Whiskered Tern: At least 30 at Gocheonnam on August 30th is an exceptional count of the species for the ROK. South Polar Skua: One intermediate plumaged bird was seen at medium-long range from the ferry to Heuksan on the 26th. Black Woodpigeon: Excellent views were had of several perched birds (including one panting in the heat), and probably 12 or more were seen in total on Heuksan Island on 26th. Long-tailed Shrike: One on Heuksan on 27th is presumed to have been over-summering. Black Paradise Flycatcher: Encountered on four dates, all on Heuksan, including probably 3+ on 27th. Light-vented Bulbul: Now widespread on Heuksan (seen in three different areas), with 15+ (including several juveniles) recorded on 27th. Chinese Flycatcher: A fairly secretive flycatcher loosely associating with several Yellow-rumped Flycatchers at the Geum on August 31st was considered by all three of the observers to be solid green on the upperparts (lacking a yellow rump, though showing a weak white wing-bar), and to be washed strongly yellow on the underparts. Yellow Bunting: One heard (and glimpsed in flight) on Heuksan on 30th is a very rare autumn record.